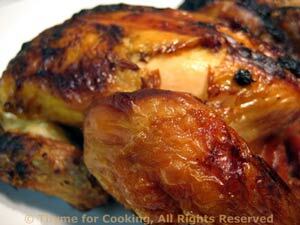 Brined Cornish Hens, easy gourmet dinner recipes. I love brining meat before grilling. It does add a bit of salt, but I don't put any in the basting sauce, to compensate. The brine adds flavor and help keeps the meat moist. If you fix 2 larger birds, have the rest as leftovers for sandwiches or use in the salad next week. Roasted potatoes, tossed with a creamy, Greek yogurt based dressing, makes an easy side dish for summer. 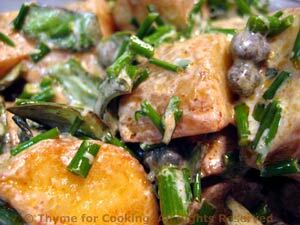 Lots of fresh, garden herbs and capers brings this simple potato salad out of the ordinary. Put oil and paprika into bowl and mix. Add potatoes and stir, coating thoroughly. Put them into an old metal pie plate or cake tin or foil barbecue container (or whatever) that you will never use for any purpose but the barbecue again.... and you should have one of these. Cook on barbecue (grill) for 25 - 35 minutes or until done... and you will need to stir them with a long-handled wooden spoon occasionally as they tend to develop 'hot spots' and can get a little crispy. Put yogurt, vinegar and oil in a medium bowl and whisk well. Add capers and herbs and stir. When potatoes are done, add to dressing and stir to combine. Serve hot, warm or cold. 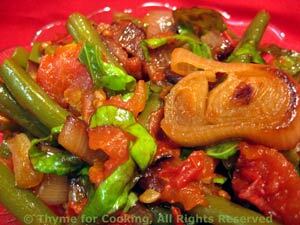 A perfect showcase for summer's bounty: Tender green beans braised with ripe tomatoes and finished with fresh basil! I often make enough to have the next day, cold. Heat oil in nonstick skillet over medium heat. Add shallot and sauté until tender and transparent. Add beans and tomato, cover, reduce heat to low and simmer 20 - 25 minutes, until beans are tender and done. If they start to dry out add a tbs of water or chicken stock. When beans are done, uncover, stir in basil and serve.